I hear it said and I read it often: Students can’t write. Really? Who says? Where is your proof? I wouldn’t let an unsupported claim stand unchallenged in my students’ writing and yet this “truth” becomes commonly accepted in halls of education and government. Yet, I also hear from my fellow teachers of writers tell stories of amazing and powerful writing taking place on a regular basis at every level of education. I have witnessed first-hand the ability of young writers to craft moving arguments on-the-spot and pull lyrical poetry out of thin air. Don’t tell me our students can’t write. Perhaps it is past time to consider that just maybe the problem isn’t the students at all. I believe that the problem with student writing is not a fault with the student writer, but with the way that we teach writing to our students. We have decades of research to support the best practices for teaching writing and yet we see writing programs at every level of education ignore these research-supported principles in favor of meaningless assignments and soul-destroying assessments taught without attention to the writing process or the social context. There are many talented educators out there doing their best to teach writing based on the principles advocated by the experts (for example, the National Council of Teachers of English aka NCTE), but most of our students are lucky if they have one year in a classroom where writing instruction guided by these principles is taught and, often, even then that teacher is constrained by local, state, and federal mandates (for example, to teach on-demand writing X hours each week). This is a systemic problem that we must address before we can even consider blaming the students. The problems with student writing are a systemic problem with the way(s) we teach writing. We know better so why are we not doing better for our students? I suspect another systemic problem is at the root of that problem (the ways that education and teachers are viewed and governed), but that is another blog post for another day. Today I want to focus on the guidelines we know are effective for teaching writers prepared by NCTE: Professional Knowledge for the Teaching of Writing. Writing has many purposes “beyond the traditional purposes that are identified in school, purposes for writing include developing social networks; reasoning with others to improve society; supporting personal and spiritual growth; reflecting on experience; communicating professionally and academically; building relationships with others, including friends, family, and like-minded individuals; and engaging in aesthetic experiences.” This means we need to expose our students to writing experiences and the writing of others that addresses these many purposes. Many student writers do not even know that they are already writers because they are taught a very limited view of writing. We must be aware of the many influences that affect writing and we must help developing writers recognize and learn to understand these influences as well. “The ways wider social situations in which students speak, write, read, and relate to other people affect what feels to them natural or unnatural, easy or hard.” We need to learn more about the influences on our students and expose them to a wide variety of new influences — while talking about structures and forms and rules that are similar or different in differing texts for differing audiences. “Writing instruction should support students as they compose with a variety of modalities and technologies. Because students will, in the wider world, be using word processing for drafting, revision, and editing, incorporating visual components in some compositions, and including links where appropriate.” While access to technology varies greatly in educational settings, it is still possible to explore and experiment with a variety of modalities to help students develop an understanding of how “new” literacies are rooted in older ones. These lessons are essential to help students transition as new literacies are developed and experienced. “Every teacher has to resolve a tension between writing as generating and shaping ideas and writing as a final product, demonstrating expected surface conventions. On the one hand, it is important for writing to be as correct as possible and for students to be able to produce correct texts so that readers can read and make meaning from them. On the other hand, achieving correctness is only one set of things writers must be able to do; a correct document empty of ideas or unsuited to its audience or purpose is not a good piece of writing.” We must help our students understand and address this tension without simply dictating rules that seem arbitrary and inscrutable. Simply helping developing writers understand the reader-writer contract can go a long way to resolving this issue, in my experience. I believe this is true, but I also know developing writers need help to learn and grow and this process usually requires good writing instruction. “Teachers of writing should be well versed in composition theory and research, and they should know methods for turning that theory into practice.” Yet, in far too many cases, those tasked with teaching writing and/or deciding the framework for writing instruction and assessment of student writing are not familiar with composition theory and research so their practice remains mired in time-worn, failed practice. However, there is no one-size-fits-all writing process that suits every writer in every writing context. Good writing is never the result of a formula that can be taught once and forevermore serve the writer. “[W]riters do not accumulate process skills and strategies once and for all. They develop and refine writing skills throughout their writing lives, as they take up new tasks in new genres for new audiences. They grow continually, across personal and professional contexts, using numerous writing spaces and technologies.” The primary goal for teachers of writers should be helping developing writers accumulate a growing toolbox of skills and strategies for writing. The goal is to equip developing writers with the ability to continue to grow and develop as a writer long after they leave the classroom. “The act of writing generates ideas; writing can be an act of discovery.” Writing is an important part of the learning process. Too much school-based writing is focused on transcription or formulas. Teachers should encourage students to do more writing simply to discover what they are thinking. Writing should be used for to support as well as demonstrate learning. “From its beginnings in early childhood, through K-12 and college classrooms, and throughout a variety of workplaces and community settings, writing exists in an environment of talk. Speakers often write notes or scripts. Writers often talk in order to rehearse the language and content that will go into what they write, and conversation often provides an impetus or occasion for writing. Writers sometimes confer with teachers and other writers about what to do next, how to improve their drafts, or how to clarify their ideas and purposes. Their usual ways of speaking either may or may not feed into the sentences they write, depending on intricate, continuous, important decisions.” Teachers need to give developing writers lots of opportunities to talk about writing — both their writing and the writing of others. This writing talk is important professional skill as well as support for the writing task at hand. “Writing and reading are related. …it’s self-evident that to write a particular kind of text, it helps if the writer has read that kind of text. …Additionally, reading is a vital source of information and ideas. For writers fully to contribute to a given topic or to be effective in a given situation, they must be familiar with and draw on what previous writers have said. Reading also creates a sense of what one’s audience knows or expects on a topic.” One area of important guidance that teachers can provide is to bring a variety of mentor texts for students especially as they explore new genres. “In any […] assessments of writing, complex judgments are required. Human beings need to make these judgments, not software programmed to score essays, because only human beings can be sensitive enough to purposes, audience, quality and relevance of evidence, truth in content, and the like. Furthermore, such judgments should be made by professionals who are educated and informed about writing, writing development, the various ways writing can be assessed, and the ways such assessments can support writers.” Too often student writing is assessed unfairly because of poor assignment design, weak instructional support, or simple misunderstanding of what growth in writing looks like. 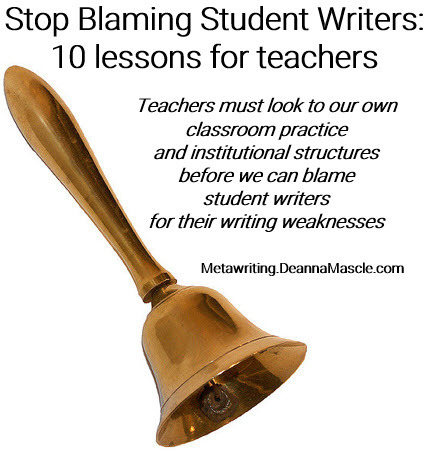 Teachers must look to our own classroom practice and institutional structures before we can blame student writers for their writing weaknesses. Educators are the experts and if we are not providing proper, research-driven support for writers then we are the ones at fault–not the student writer. There is a systemic problem with student writing in American schools, from kindergarten through college, but the problem does not lie with the students. Writing is a complex process and we should stop teaching it like a simple formula is ever the answer to successful writing. Teaching writing is a complex process and we should stop telling teachers it can be taught using simple gimmicks.